As I mentioned in my Round One post my first visit left me with plenty more beers to drink at the Oregon Brewers Festival this year. As it turned out it took me not one, but two more visits to feel like I'd covered as many bases as I needed to feel satisfied and that I hadn't missed anything. Although I did have some additional, non-sour beers, overall it was the offerings from the Sour Tent that I found most pleasing. Those included Mt Emily Pear, an effervescent brew with light pear aroma and a slightly cloudy appearance, 10 Barrel Go Go Boots, a session sour that the brewer described as Sour Patch Kids with grapefruit and McMenamins Black Cherry Sour, a darker, heavier sour beer that I would swear is the cousin of Rosie's. Probably the most outstanding non-sour, non-IPA beer to cross my lips was Occidental's Kellerbier. I've said these things before and I'll say them again: 1) I typically don't like German beers and 2) Occidental is turning out some great beer, regardless of the fact that they primarily make German styles. Once again OBF offered a great time and great beers for beer geeks as well as non-beer geeks from near, far and everywhere in between. You can bet I plan to be there next year; hopefully you will, too. 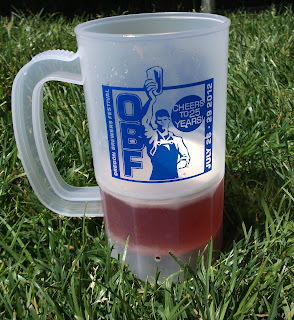 My first day attending the Oregon Brewers Festival I went, as usual, with a fairly well outlined plan of attack. Cheat sheet in hand, I was determined to cover many of the fruit beers first so as not to muddle my palate with the delicious hops I was sure to find in the IPAs that I love. Of the 12 I'd identified wanting to try I made it through 10 of them with minimal "interruptions" - a few of the "here, try this" variety, two IPAs and a visit to the sour tent. Of those 10 fruit beers there were a few I would politely refer to as, "refreshing, like a cold glass of water is refreshing." There are bound to be some of these in any offering of fruit beers, ones where the fruit flavor just didn't come through as strongly as I was hoping (and maybe not even as strongly as the brewer was hoping for...who knows though?). The one that easily topped my list was 10 Barrel's Raspberry Crush. The raspberry flavor was well rounded, not too sweet and of course, the beer was visually breathtaking. One of my drinking companions suggested that it would make a great sorbet. I think he's right however I'm not sure I could part with any of it to make sorbet. Also high on my list was Old Market's Cherried Alive. This 7.8% beer could be a dangerous one as it drinks more like a 4%. If you like fruit beers this will probably provide the most bang for your buck. My only trip into the combined Buzz/Sour Tent yielded utter happiness in the form of Deschutes' Blackberry Sour Ale. I'm generally hesitant every time I plunk down two tokens, wondering if what will be poured into my glass will really be worth the heftier price. This most certainly was! I mentioned that I had deviated, briefly, from my fruit beers first plan, inserting two IPA on my list. Both Elysian's Space Dust IPA and Flying Fish's Exit 16 Wild Rice IPA were of the delicious, stanky IPA variety that is my most favorite. They were so good that after each one I was tempted to ditch my original plan and go after more hops. By the end I hadn't made it all the way through my list, but I'd had my fill for the first round. So I guess that means there will have to be a round two. Stay tuned for more. The Oregon Brewers Festival starts next week and just like any good beer geek I've taken a fine tooth comb to the beer line up. One very exciting, new addition to the festival this year is the Sour Tent. Like the Buzz Tent, the offerings here are special and specially priced at two tokens each, samples only (no full pours available). They'll be trying to tweet out when new beers go on in each tent but I'll probably also be keeping my eye on Untappd check-ins as a supplemental source of information. Being a Minnesota transplant I was particularly interested to see two Midwest breweries represented - Summit Brewing hailing from St. Paul, MN and Sprecher Brewery from Milwaukee, WI. As far as I know these breweries are new to OBF this year and are not currently distributing to Portland. That begs the question, "Are they considering it?" Summit EPA used to be one of my go-to beers, a beer you could find in my fridge virtually any day of the year. I'd be awfully happy to see it nestled in with my Oregon favorites in the future. IPAs, double IPAs and special/mystery beers will be high on my list of ones to try and I'll likely be dropping plenty of tokens in the Sour and Buzz tents. The beers I can typically find around town, even the ones I really enjoy, I'll leave for the out-of-towners, which make up 56% of the estimated 80,000 people expected to attend. What beers are you looking forward to drinking? Harvester Brewing, one of the new kids on the Portland brewing block, held their belated grand opening last night. You may have already seen some of their bottles around town but my favorite part of the grand opening came out of a tap, not out of a bottle. Until now their line up consisted of Pale, Red, Dark and Raspberry Experimental. Last night they treated folks to a taste of their newest brew, an IPA. Before we go much further, in case it has escaped your attention one of the things that sets Harvester apart from other breweries is that their entire line up is gluten-free. There are other gluten-free beers on the market, probably the most widely known in these parts is Widmer’s Omission. In place gluten-containing grain Harvester is using locally sourced chestnuts that are roasted in their Persian coffee roaster. Just like grain that varies from a lightly toasted blonde to a deep chocolate, so are the chestnuts. For someone who doesn’t have a gluten intolerance drinking gluten-free beer isn’t high on my radar. However, just like organic beers, they’ve come a long way since they first hit the market and as long as it’s a tasty, well-made beer I’m happy to drink it. So in case you’re wondering, here’s my quick take on their five beers, all of which are approximately 5.8% ABV. Pale – It’s just what it says it is. It’s not a NW pale packed with hops. It’s an easy drinking brew that’s great for warm weather. Red – Most reds don’t do much for me. One exception is Coalition’s King Kitty Red due to the unusually high amount of hops. Harvester’s is another exception but instead of being hop-forward it’s the pleasing flavor of sorghum, reminiscent of molasses, that sets it apart from the average red. Dark – I know, dark is not a style but that’s part of the point here. This isn’t a porter or a stout and it’s appearance might make you think you’ve been mistakenly poured a red. But you would be mistaken if you didn’t give this a try. It has that great, lingering roasty flavor one might find in a stout or porter without being heavy. Raspberry Experimental – Fruit beers have been popular of late, with a whole, wonderful festival devoted to them. Many of those beers have a pale or wheat base whereas Harvester has wisely used their red. It plays very well with the raspberries, one of the harder fruits in my opinion to do correctly. IPA – I’m a hop head and while this isn’t a knock you over the head IPA it is nonetheless a nice representation of the style. Cascade hops are used throughout the brewing process as well as Horizon, Willamette and Meridian. Harvester is currently only open for dock sales on Thursday afternoons. Only cases are for sale but if you’re unsure what you want to buy they’ll happily oblige you with a sample. Gluten intolerant or not they’re worth a try. For as much thought as I put into my food choices - being concerned about where it comes from, how it's produced, etc. 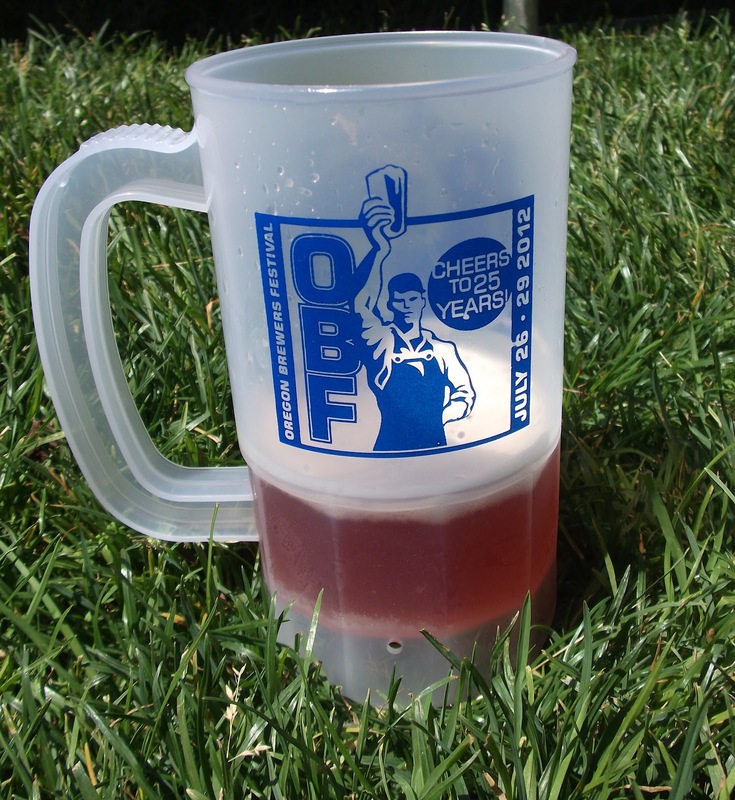 - you might assume NAOBF, the North American Organic Brewers Festival, would be right up my alley. You would, however, be incorrect. I skipped the festival last year and until a couple of persuasions came my way to attend this year, I was planning to skip it again. Maybe my lack of interest has been because I don't regularly seek out organic beer. I'm not saying that I haven't had some good organic beer, I'm just saying that whether or not it's organic has little to no impact on my beer selection. It probably should, especially since organic beer has come a long way and is now often as outstanding - or disagreeable - as any non-organic beer on the market. This year NAOBF touted over 50 beers, some from dedicated organic breweries like Bison and Hopworks along with offerings from non-organic breweries like McMenamins, Uinta and Logsdon. While I had no ambitions to try every beer I did pour over the program as well as solicit recommendations while manning the Brewvana booth during the first few hours of the festival on Saturday. Departing from my usual listing of only the highlights - and possible lowlights - here's the full list of my samplings: Fish Tale Organic IPA, Laht Neppur Peach Hefeweizen, Fort George South, Pints Green Line Organic Summer IPA, Two Kilts Imperial IPA, Laurelwood Organic Green Elephant IPA, Alameda Yellow Wolves of Thailand Imperial IPA, McMenamins Concordia Brewery School's Out Organic IPA, McMenamins Oak Hills Brewpub Altered State Alt and Uncommon Brewers Bacon Brown Ale. The one beer that I tried that really knocked my socks off was School's Out IPA from McMenamins Concordia Brewery. Really. Generally I'll choose other beers over McMenamins but as I found to be the case earlier in the year at the Battle for the Belt, sometimes they can really knock it out of the park. Concordia Brewery is housed in the Kennedy School and being unfamiliar with the availability of McMenamins' brews outside their "home pub" I'm not sure if I'll be able to get any more of this. So if you happen to hear of it on tap somewhere, let me know. I want more of it. Beyond that the IPAs from Fish Tail and Laurelwood fulfilled my hop head desires, with the rest falling between that and "meh." Nothing was disagreeable to me and I didn't detect anything off in these beers. In the end, I'm glad I had reasons to attend. Overlook Park is a beautiful space and when next year's festival rolls around there's a pretty good chance you'll find me there. The taps, ready for the day. Braving the weather and enjoying the brews.